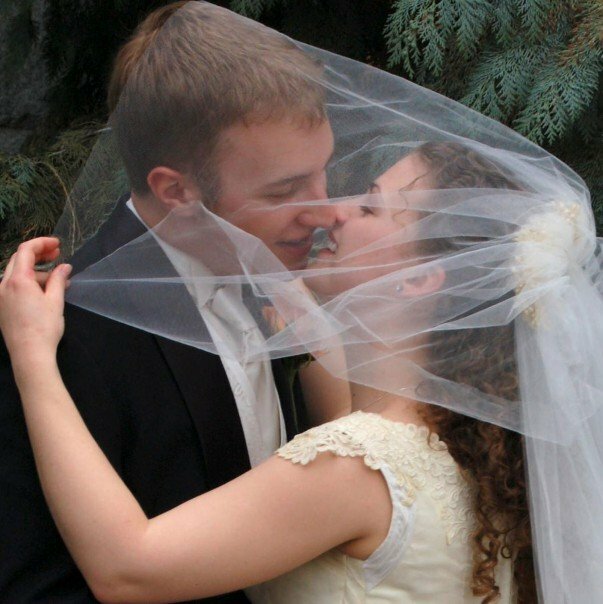 Six years ago today, I had been married for just a day. It was a full day, too–checking out of the hotel, going to Liturgy with my parents, opening a few gifts before they started the drive back down to California, and then packing and moving all of our essential things to a new house–just for two weeks while we finished finals, before leaving for our honeymoon–because we both had roommates who didn’t want to be in a house with just-married folk. I understand that. Six years later, I still remember the feel of my feet in my shoes. I remember the sound my dress (my Momma’s dress) made as I walked. I remember how Taylor’s hand fit so perfectly around mine during Mass. Six years and (at last!) one daughter later, I am still his bride, his own. Such is my Lover, such is my friend. Congrats again. Love you guys. Congratulations! Lovely photo, too. Like you, I wore my mother’s dress when I married… what a lovely connection to have to her, no?